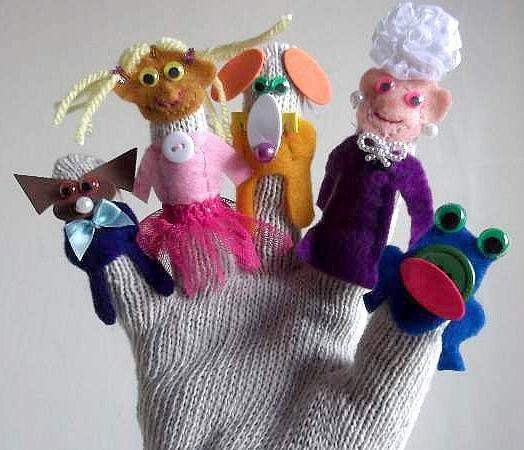 I will show you on this page how to make finger puppets from your craft bits and bobs. 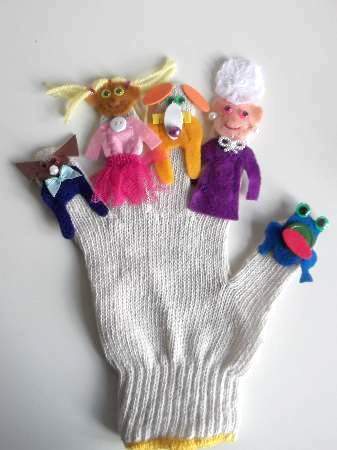 All you need is a cotton glove like I have used, or an old wooly one you don`t wear anymore. 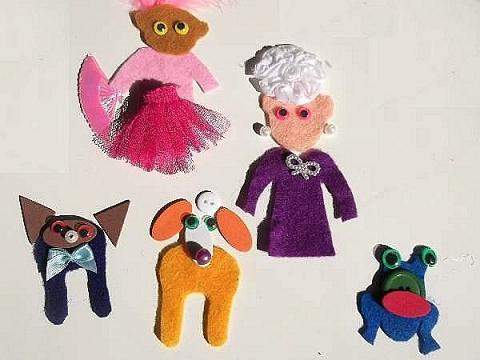 Along with any scrap materials that you have, some felt will be very useful if you have that too. 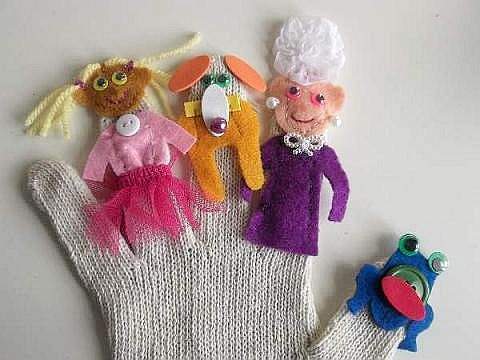 You will need a needle, various colors of thread, some scissors and glue. If you don`t have googly eyes, use tiny beads or white felt and a black pen. if you don`t have felt, use fabric. Have a good look at what you have gathered and think about the shapes and how they could be used. I arranged the sponge shapes to make finger puppets with floppy ears, big mouths and long noses. The beads looked like earrings fit for a lady and turned the ends of the animal noses into real sniffers which look so cute. 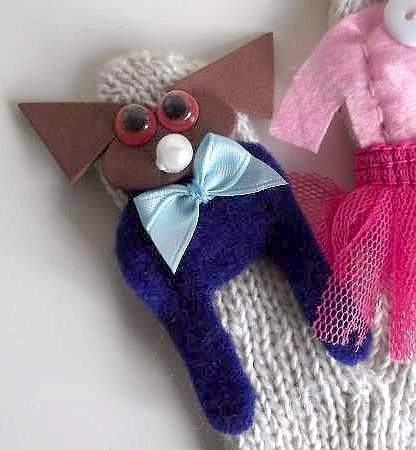 Play around with your scraps and they will soon shape into funny characters. 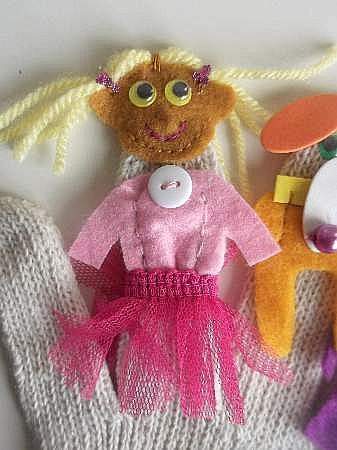 When you are happy with your creations cut out some dress and body shapes from felt or fabric. Ok! 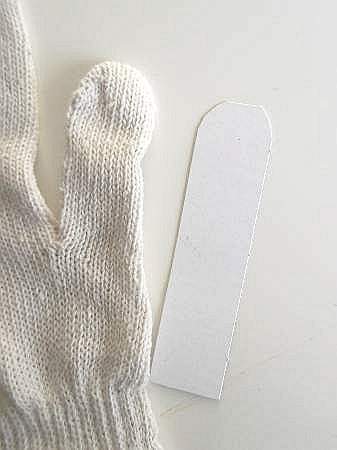 It will help if you cut a length of card about 3/4 inch wide and the length of the glove fingers. Cut off the top corners to make a curve and push it inside for a backing and support as you make each character. It will also prevent you from sewing through to the other side. 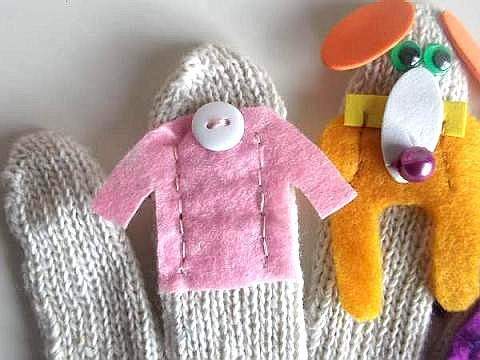 To make finger puppets that won`t fall to pieces, learn to sew them on. Back stitch is quite easy. It `s like running stitch, but instead of just pushing the needle in and back out, you go behind your last stitch and come out in front of it. So thread up with a color that matches the piece you want to sew on, and just stitch it along the center or around the body. No need to sew the limbs in place. 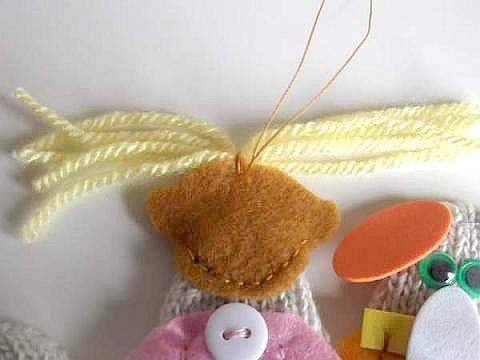 Note: Watch the video below showing how to make these type of stitches. With this nice big green button, I made a frog. There was no green felt available, so I used blue. It goes well with the green eyes, don`t you think? 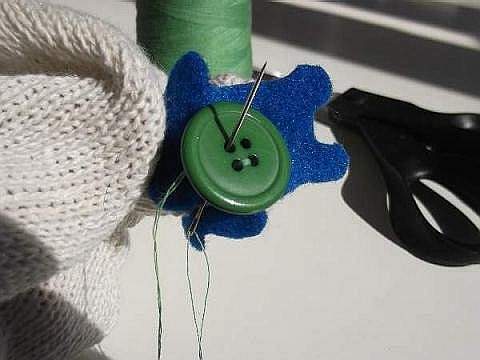 Can you see how to sew the button on? 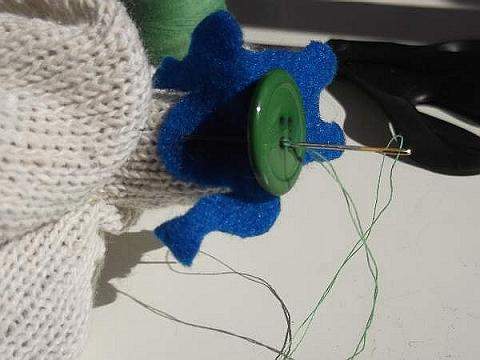 Push the thread through one of the holes and catch the fabric underneath then push it back through the opposite hole. Do this several times and then cross over to the other two holes and do the same. 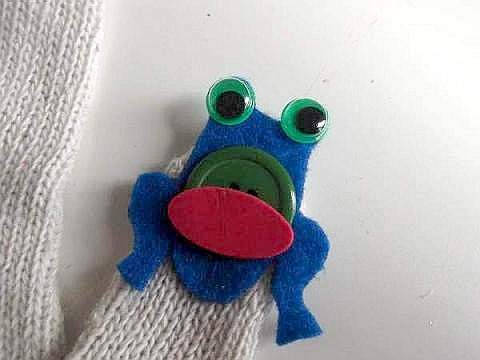 Now my frog was ready for its googly eyes which have peel off sticky backs that seem to stick to the felt quite well. The big red foam shape was ideal for a mouth. Don`t use PVA glue for craft foam shapes! They won`t stick for long. 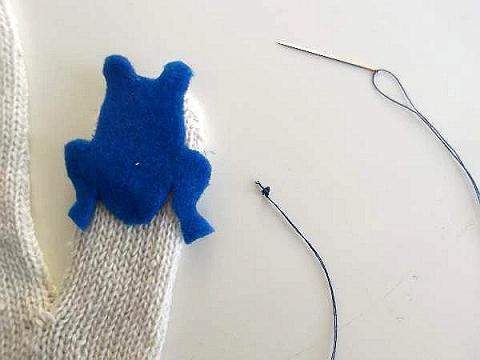 Use a fabric glue for a better hold. 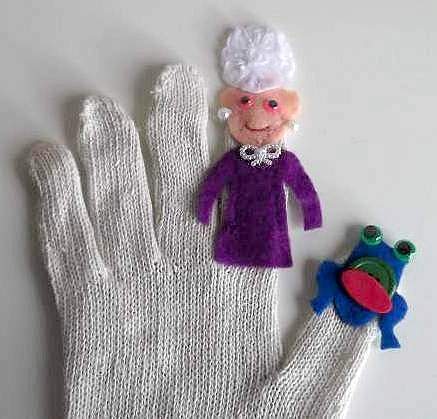 Moving along to the next glove finger you will see there is a chique lady with a posh hat and pearl earrings. The hat looks like hair actually. Again start off by sewing on the body parts. Sew on the head and dress first. Then the features, the eyes, nose and smiley mouth. Any accessories can be sewn or glued on last. This lady owns a big dog. He is the next character I made from my bits and bobs. Did you notice that I have created 2 dogs and they are very unusual. That makes them much more interesting and funny. I only needed to make the body parts with 2 front legs. That`s all that`s needed for an audience to recognize that they are dogs or any other four legged creature. The long sponge ears and nose are glued on but the bead at the end of the nose is stitched in place. My next character is a little girl with a tutu. 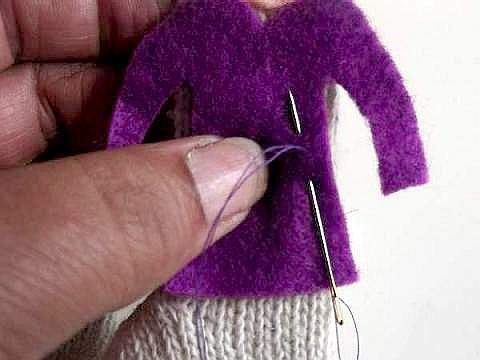 Stretchy tape or trimming can be stitched around the glove finger to make a cute little skirt. 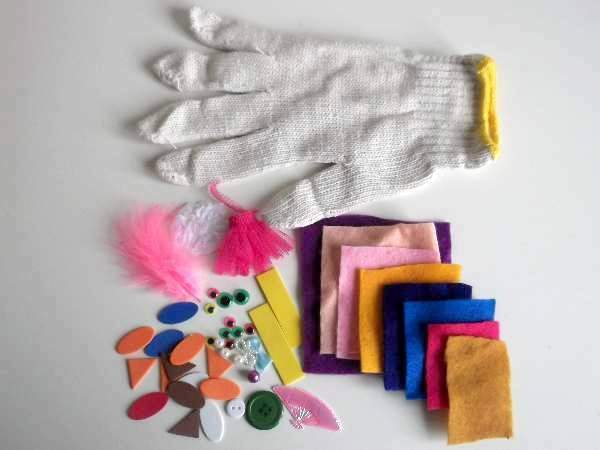 I found this pink stuff in my local haberdashery which is a super place to go if you don`t have any scrap craft materials to make finger puppets with. It looks just like a ballerina`s tutu, and the matching pink top is cut from thin craft felt. It was a toss-up between a feather head dress or a hair-do for this fourth character. As you can see I chose the latter. You only need a few strands of wool. At the half-way mark, sew them to the top of the head and place a few stitches just above the ears if you want to make them bunch. The hair ties are made by glueing nail jewels over the stitches with PVA glue. The last character is another little dog belonging to the ballerina. He is completely different from the previous. He has a short nose this time using just a bead. His face is an oval foam shape with triangle ears. Just love the bow collar, matching the blue body and legs. Looks like he`s dining out! 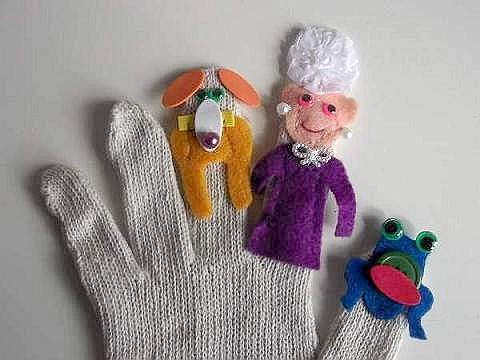 So, that`s how to make finger puppets on a glove, and funny ones at that! Enjoy! 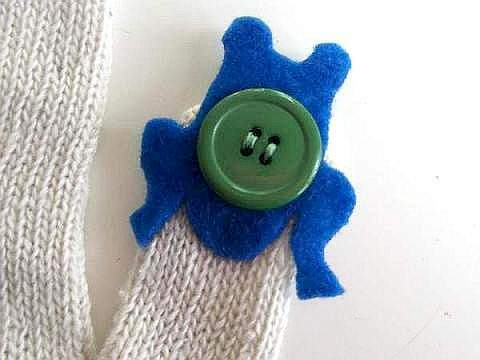 Here we have easy and more advanced sewing crafts.